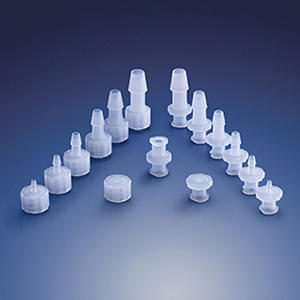 Qosina is a leading global supplier of more than 5,000 OEM single-use components to the medical and pharmaceutical industries. 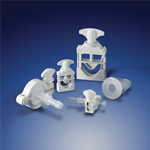 We offer free samples, low minimum order requirements, just-in-time delivery, modification of existing molds, and new product design and development. Qosina is ISO 9001, ISO 13485 and ISO 14001 certified, and operates in a 95,000 square-foot, climate-controlled facility that includes an ISO Class 8 Clean Room. Our Qosmedix subsidiary serves the cosmetic, skin care and spa industries. 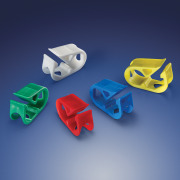 Qosina offers Clamps in an assortment of size, color, and style. 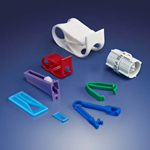 In stock and off the shelf, disposable Clamps include Closure Clamps, Hose Clamps, Pinch Clamps, Roller Clamps, Slide Clamps, and Towel Clamps. Available in an array of sizes, Clamps will fit tubing dimensions ranging from .125 inch OD to 1.5 inch OD. 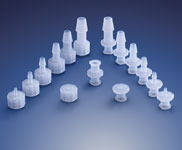 Material selection consists of polyacetal, polypropylene, polycarbonate, and other high quality plastics for safe and secure use. 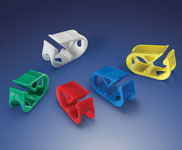 For easy differentiation, clamps are manufactured in wide variety of colors. 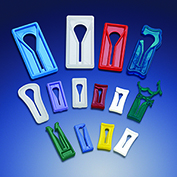 Qosina also carries Catheter Clamps, Flow Control Clamps, and non-reopening clamps in range of size and color. 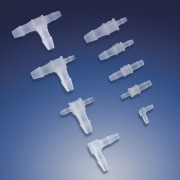 Clamp sample kits contain different examples from our catalog and can be purchased for design and testing. 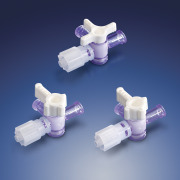 Qosina has added several components to its ENFit™ line, including male and female connectors and caps, low dose syringes, spikes, adapters and Y connectors. These parts are available in various sizes and materials and complement Qosina’s already-vast selection of ENFit™ products. Qosina continues to grow its ENFit™ line and can modify any existing component or build new tooling to suit exact requirements. 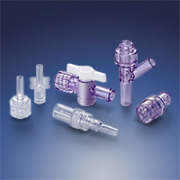 Tubing Connectors are available from Qosina in a vast selection of materials, sizes and styles including straight, elbow, T, Y, with luers (male and female with rotating spin locks), barbs, or UNF Thread. 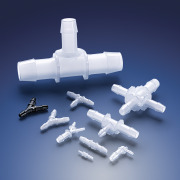 Our inventory also includes a comprehensive selection of plastisol connectors which are flexible and have multiple Inner Diameters. 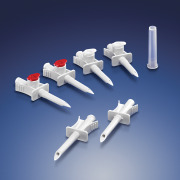 Connector sample kits contain different examples from our catalog and can be purchased for design and testing. 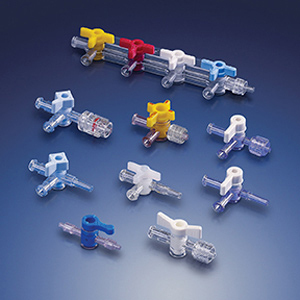 Single Use Bioprocessing Components lower production costs, decrease time to market and reduce the risk of cross contamination. 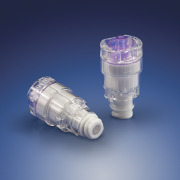 Our patented flow path components include polypropylene barbed flanges with a platinum cured, medical grade silicone gasket mechanically attached to the fitting face. 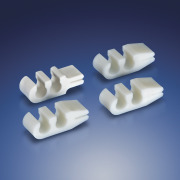 Bioclamps™ are a patented tri-clamp with a quick release, providing an easy assembly and secure connection between our barbed flanges and polypropylene BioEnd Caps™ BioEnd Caps are designed to permanently terminate a disposable manifold until an in-process new sterile connection is made. 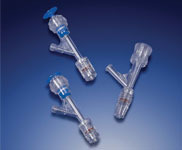 To control the fluid flow rate, use Biovalves™ which can be easily added to preassembled systems without cutting tubing lines. 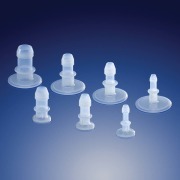 All Qosina bioprocessing components are made from Class VI compliant materials. 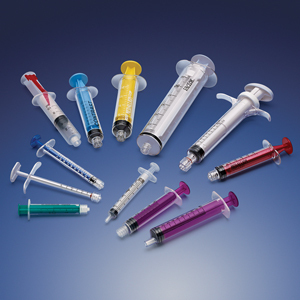 Qosina is a comprehensive source of bulk, non-sterile syringes, in stock and ready to ship, in a variety of materials, sizes, grips, and colors. 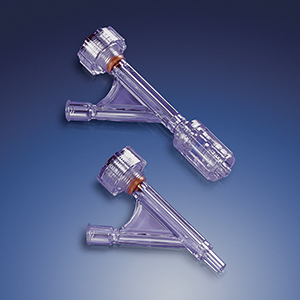 The extensive offering consists of standard syringes, control syringes for regulating fluid, open ended syringes for viscous fluids and more. 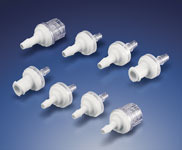 They offer various tip styles, including male and female luer locks, rotating male luer locks, male luer slips, catheter tips, curved tips, and eccentric tips for applications such as dispensing, irrigation, loss of resistance, negative pressure and more. Qosina is also a distributor of genuine BD™, Monoject™, Medallion™ and VacLok™ syringes. 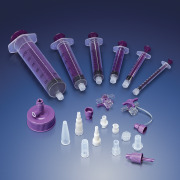 In addition, the Qosina Catalog presents a wide variety of syringe accessories such as caps, dispensing tips, finger grips, handling blocks, and sheaths. 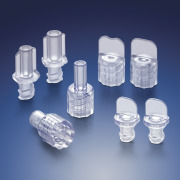 Qosina is world renowned for having the largest selection of luer connectors including female luer locks, male luer locks,and male luer slips and metal luer tubing connector configurations. 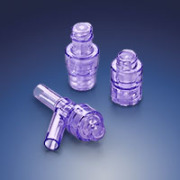 View our male to male luers, male to female, female to female, high pressure luers, luers with break off tips, luers with spin locks to prevent tubing crimps, barbed tubing connectors with female luer locks, male luer locks or male luer slips, and pre-assembled extension lines. 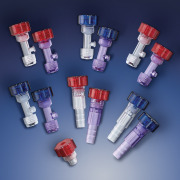 Luer sample kits contain different examples from our catalog and can be purchased for design and testing. 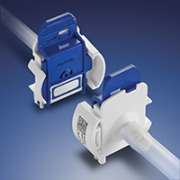 Non-luer fittings provide an important alternative to traditional luer connectors by eliminating the possibility of misconnection errors. 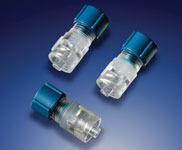 This category contains connectors (male or female) and caps (vented or non-vented), and CPC® Quick Disconnect Couplings. Check valves are pressure activated to prevent backflow. Choose our one-way, dual (with male, female and tubing ports), luer activated, duckbill, or relief check valves to meet your requirements. 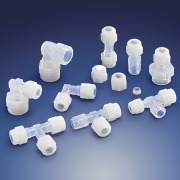 A check valve sample kit contains different examples from our catalog and can be purchased for design and testing. 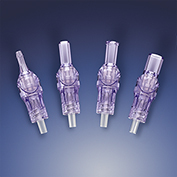 Needleless or luer-activated valves are normally closed but open with the male luer tip of a syringe, or other male luer connector. 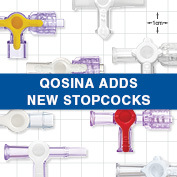 Available in single, T, Y and multi-port manifold styles, Qosina stocks a selection in various materials, sizes, and designs including swabbable valves. 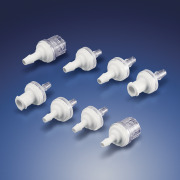 Qosina offers a large selection of hemostasis valves and tuohy borst adapters which provide a seal for secure positioning and prevent backflow. 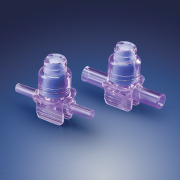 Hemostasis valves also feature a side port with a female luer lock for easy attachment of a secondary line. 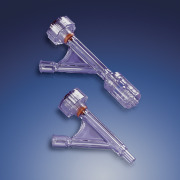 Many sizes are available; up to 10 French for our hemostasis valves and up to 18 French for our tuohy borst adapters. 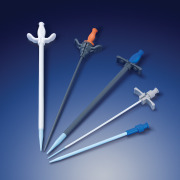 Qosina also offers many other kit components including stopcocks, extension lines, scalpels, guide wire accessories, and angiographic needles. A Tuohy Borst Sample Kit and a Tuohy Borst Component Assortment Kit that contain different examples from our catalog can be purchased for design and testing. 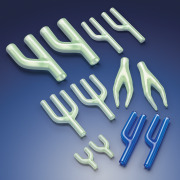 Stopcocks are offered in 1, 2, 3, and 4-way fluid direction and 2, 3, 4, 5, and 6 gang manifolds. 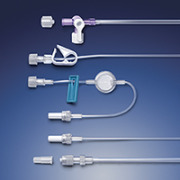 Connections include male luer slip, male luer lock, male luer with spin lock, rotating male luer lock, female luer lock, and tubing ports. Stopcocks are offered in various pressure ratings from 6 psi - 1200 psi. 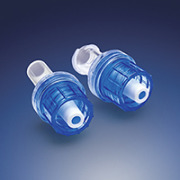 A polycarbonate or polysulfone body provides lumen clarity which helps identify media flow. 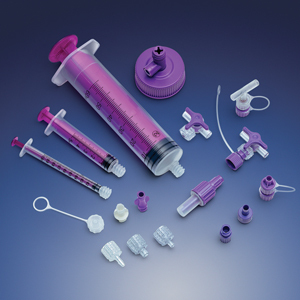 Ideal for testing, medical stopcock sample kits are available for purchase; containing various configurations, pressure ratings, handle rotations, and colors. 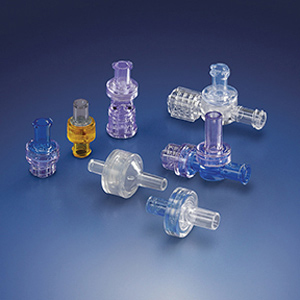 Qosina offers a wide selection of in-stock and custom medical tubing for your prototyping and large-scale production requirements. 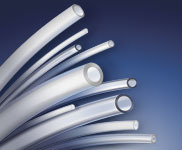 Whether your project requires PVC, Silicone, FEP, HDPE or DEHP-Free PVC tubing, Qosina supplies various sizes and durometers off-the-shelf to meet your ever-changing needs. 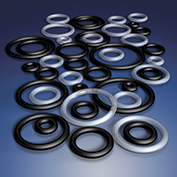 For over 35 years, our Sales and Product Development Teams have been providing our customers with custom tubing solutions. 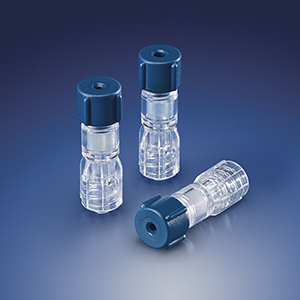 Qosina has the capability to provide cut-to-length tubes and multi-lumen configurations, along with custom durometers, sizes, colors and materials. 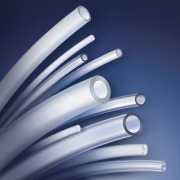 With popular brands such as Tygon®, C-Flex® and PharmaFluor® available for immediate shipment, our tubing is competitively priced and is easily customized to your specification. Tools are available in the form of forceps, tweezers, scissors, and safety scalpels. 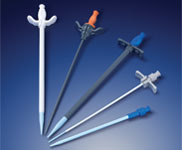 Forceps are offered in styles including locking, adson, iris, serrated dressing, needle holder, and transfer. Tweezers and scissors are available in a variety of sizes, colors, materials, and finishes. 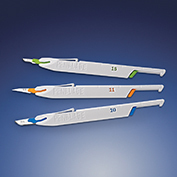 Scalpels have been designed for easy one-handed activation available in a variety of blade sizes. 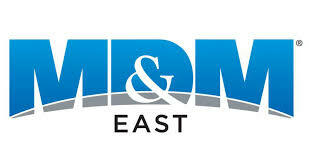 Call one of our Customer Specialists and experience our unparalleled customer service. Prompt and efficient service is the heart of Qosina's business. Request samples, place orders, discuss your project or source components that do not currently appear in the Qosina Catalog. Custom Sourcing requests are welcome for tool modifications, hard to find items, subassemblies or tubing. If you can't find a specific item, give us a description of what you are looking for and we will work to find a rapid solution for your R&D, production or design challenges. Support your production requirements with Just-In-Time, Kanban style delivery from our ISO 9001/ISO 14001 registered 95,000 square foot climate-controlled facility with a Class 100,000 clean room. Place a “blanket” order and let Qosina release your parts according to your schedule as you require them. Invoices are generated at the time of shipment, only for those parts that were shipped. This service cuts inventory levels, shortens production lead times, reduces required manufacturing space and may lead to quantity discounts. We exhibit at over 20 Trade Shows each year, domestically in the U.S. and internationally in Germany, France, U.K., Ireland, Korea, Japan, and China. Visit us at one of our booths to discuss your project in person and view a selection of parts from our catalog. Please contact us in advance for a Free Pass to one of these events.